• I am a broken melon right now. • 5 FREAKING STARS. I'M UPPING MY RATING AND NO REGRETS. • The ending broke me even more if that's possible. • Like I honestly want to sTRANGLE ARIN RIGHT NOW but I love him too and ship him and Kestrel so so sososososs hard. But remember what I said about strangling? Still stands. 100%. omg Arin, YOU DUNDERHEAD. • Although I have to admit, Arin's time with Roshar's people still bored me and I think it was clever and I'm glad it was brief, but. Honestly. no. • Also Kestrel was just so losing it with all her mind games agasinst the emperor. She was drowning in this book. I was drowning. But she drowned in political games, I drowned in silly feels over fictional people who don't even exist. • I couldn't put it down. • Kestrel is SO GOOD at being two-faced, I love her. • Also there was a lot of blood and cutting and people dying that I didn't want to die and excuse me but this is not okay. • I'M JUST KIDDING. IT'S TOTALLY OKAY. I do so love an author who doesn't spare the characters. • Also that dessert Kestrel ate in the first few chapters that was all pink whipped cream and a sugar crystallised spoon? Yeah. I want one. • WHY DOESN'T THIS SERIES HAVE A COOKBOOK. so. much. food. • Anyway. I'm talking about food to distract myself from my intense emotional turmoil. I AM SOBBING. • WHERE IS BK3. CURSE YOU SLOW MAILMAN. WELL. YESSSSS FOR THIS BOOK! I confess to being a black sheep when it comes to book 1, The Winner's Curse. I didn't ship Arin and Kestrel. I felt really blah about the plot. It was just a "meh" read for me. THEN ALONG COMES BOOK 2 AND NOW I'M OFFICIALLY IN LOVE WITH THIS SERIES. It's perfect, it literally is. It's gorgeous and rich and it's a refreshing fantasy world with no ties to ours (yay!) and I can really get behind the characters. I totally ship Kestrel and Arin now. I didn't before, but oh gosh, these two are SO messed up. (I love a good messed up romance, I truly do.) They spend all their alone time thinking about not thinking about each other and the second they get together they HATE on each other. It's complicated. Kestrel is betrothed to the Emperor's son, Verox. This could make it a love-triangle, but it really doesn't. Verox is...um...useless. He plays with puppies and he's possibly not overly intelligent (?! not sure) and everyone knows he's just a stepping stone for Kestrel to be Empress. Verox's own FATHER doesn't even like him. He prefers Kestrel! WOAH. I felt Verox was a real stuck up snob at the beginning, but he's just a sad boy and I feel for him. And Kestrel? I love Kestrel. She's a really refreshing blend of super high intelligence who still appreciates femininity. I'm not saying anything against girls who punch and only wear pants. I love them too. But this was NICE. For once Kestrel wasn't ashamed of wearing a dress! YAY. And omg, have you seen teh covers?! They're gorgeous. (I do have a small spot of confusion, though, knowing the wedding dress is red in the book...the UK cover is red. But the US cover is blue? So is the wedding dress a different colour in the US book?!! #confused) I also loved seeing some of Kestrel's military strategies in play. She's a smart little cookie. Oh Arin, Arin, Arin, you KNUCKLEHEAD. Arin is totally smitten with her and he is so angry because he doesn't want to be. He makes stupid decisions, he's rash, he doesn't listen. Basically I love this little knuckleheaded lad. I love him a lot more in this book. Although I kind of want to smush Arin and Kestrel in a room with NO ONE LISTENING and say "Sort out your issues." There is so so many unanswered questions and complex issues in this book. I NEED THE NEXT ONE ASAP. I was quite emotionally involved in this book. Is it hard to tell? Hm. SO IF YOU NEED ME I'LL BE CRYING ABOUT THE CLIFFHANGER BECAUSE MY DARLINGS ARE ALL IN TROUBLE AND PROBABLY GONNA DIE. 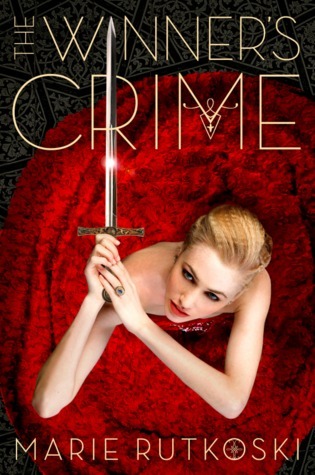 Sign into Goodreads to see if any of your friends have read The Winner's Crime. 17.98% "I CONCEDE MY PREVIOUS NON-SHIPPY THOUGHTS. Kestrel and Arin are rather adorable pretending not to like each other." 52.96% "WELL. Angst. I feel a little sorry for Arin, because Kestrel's given him NOTHING. Srsly, woman, you broke his heart." 73.89% "I have no idea what on EARTH Arin is trying to achieve. But Kestrel is loooosing it. POOR WITTLE KESTREL." 25.86% "RE-READ TIME. OH YEAH. Also if The Winner's Kiss doesn't arrive in the mail tomorrow I will either a) die, b) die or c) actually be okay with that because AM I EVEN READY FOR THIS TO BE OVER>?????" 67.73% "Arin: I HATE KESTREL.\n Arin: I SHALL NEVER LOVE HER AGAIN.\n Arin: *spends 394839 hours thinking and pining after Kestrel*"
I LOVED IT!!! I'M SURPRISED BUT I LOVED IT! Aw, I liked Verox. Loved their friendship. (view spoiler)[ I did think the piano room thing was a bit of an awkward device. (hide spoiler)] But this is how romantic angst should be done!